Here’s a 55 fiction story I wrote for a contest held at work. We were given a theme and had to write something in 55 words or less in 20 minutes. My theme was ‘Nature’ -and I won the first prize. Yay !! 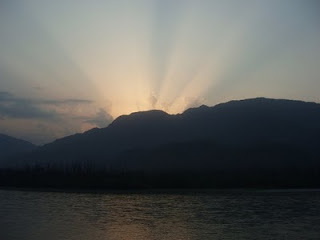 The picture was clicked by me at Rishikesh ! She sat outside, waiting for the Sunrise, her mood as dark as the Night Sky. Slowly the sun peeped out from behind the mountains, bright and shiny as a newly minted coin, its rays like yellow arrows against a backdrop of flaming orange sky. Suddenly, all was well with the World again. @meira,swaram - thanks guys ! @Aditya - thanks and welcome ! 'what a wonderful world'...maybe dis fiction best describes dat song....lovely!! !